Most anyone who knows me knows how much I love to geocache. If you aren’t familiar with the term, *geocaching* is basically a high-tech treasure hunt. A container, or *cache*, is hidden somewhere (anywhere, from a park to a field to a parking lot) by the hider and the coordinates are recorded and published to a website. Then the seekers view the published listing and go searching for it, using a GPS unit or a GPS-enabled smartphone (iPhone, Android). When the cache is found, they sign a log inside the container, then log their find online. It’s loads of fun, largely because it can be done anytime, anywhere. The containers are classified into sizes ranging from nano (tiny) to large (really big). Common examples include film containers (very popular for what’s known as *”park ‘n’ grab”* hides because they are usually very quick and easy to find), magnetic key boxes, lock and lock (Tupperware-type) containers, and ammo boxes (metal cans once used for storing ammunition are popular for hides in the woods). • Where are you planning to hide it? A hide in the woods might use a pine cone or a hollowed out stick, whereas a city hide might be more suited to a fake electrical switch, a retrofitted cable, or a bolt on back of a signpost. • How devious, er, difficult, do you want it to be? Geocaches are rated in difficulty from level 1 (easy) to level 5 (difficult). The rating takes into account both the difficulty of the container as well as the likely amount of “muggle” (non-caching persons) traffic in the area. • How much time and money do you want to put into your creations? 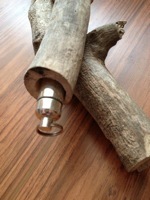 Many creative caches can be fashioned with little more than some good glue and household items. Duct tape comes in many patterns and colors now, camouflage being one of them. A clean plastic jar, such as a peanut butter jar, covered with camo tape makes a great container for hiding in a tree stump or under some branches. Add a rotary tool, such as a Dremel, to the mix, and you’ve just upped the ante quite a bit in terms of what you can do. Making whizbangs (see previous post) is super-easy and costs nothing but a little time. If you have some money to spend, you can make some diabolical cache containers with things like PVC pipe, water hose and spigots, drain covers, and more. Here are just a couple of examples that I’ll leave you with today. The first one is similar to the Bottle Cap cache I detailed in my last post. However, rather than using a bottle cap from a beer or soda bottle, this one uses a penny as the decoy. .The penny is glued to the screw top or flip top of a small cylindrical vial. When dry, drop in your log and you’re good to go. These work great as hides in neighborhood parks or parking areas near a convenience store where there is a little gravel mixed with dirt. Just dig up a little bit of dirt, slide it into the ground, and the penny is flush with the ground as if it was just dropped. Sneaky 😉 I recently saw it done with a small colored rock as well. It was glued in the same way, but was just a little different. Put your own individual touches on it. The next one is still a work in progress. I hollowed out a small stick, and slid a bison tube inside. I was thinking about hinging the other part of the stump where I’d cut it, but I think I’m going to just glue the bison into the hollowed out portion, and leave it sticking out slightly. That way, it (hopefully) won’t go missing from the stick that houses it, and it won’t be too difficult to find. Then, the finders will simply have to unscrew the top of the bison container, sign the log, screw the top back on, and replace the stick. What ideas have you come up with for your own creative caches? Let me know in the comments. Until next time, cache on! Not long ago, I came across a type of cache that I’d heard about at GeoWoodstock, but had never seen. The cache title, which referenced good luck, had me thinking that maybe I was looking for a penny on the ground The site is a neighborhood park near my house, and the coordinates led me to a slightly rocky area over a drainage ditch, with lots of small gravel rock interspersed with grass. So, I started looking. Sure enough, about 10 minutes later, I saw a penny on the ground. My heart started beating faster. When I picked it up, lo and behold, it had a tiny container attached to the bottom with a flip-top lid. 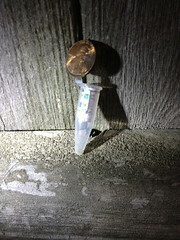 The vial was pressed into the ground so that only the penny was visible, just like when you find one lying on the ground. I signed the log, and replaced it into the ground, excited to add to my collection. On the way home, I was thinking that I could easily make that, but, not wanting to use my hard-earned pennies, I decided to use bottle caps. I had some bottle tops from a few glass Coca-Cola bottles. I rinsed and dried them then put a couple drops of contact cement in the cap. I let them dry overnight, then checked them. They turned out great. I put a tiny little log in the vial and it is ready for its new hiding place. The good thing about this type of cache is that it can literally be hidden almost anywhere, from a park to a playground to a parking lot. I’m working on some ideas for some slightly more challenging caches now. I’ve heard a lot of interesting ideas, and I know the types of areas we cachers are likely to frequent, so watch out for some upcoming evil caches. Fee free to suggest some “evil” or otherwise challenging caches for me. What’s the most creative or challenging cache you’ve seen? Let m know in the comments.